For Lacie and David’s first anniversary, we celebrated an epic anniversary Forever Session with them in the ever beautiful Providence Village! It’s so crazy to think that it’s already been a year since their B&A Warehouse wedding. We’d had the chance to spend time with them throughout this past year at some of our J&A events, and getting to know them has been a big blessing to us! Providence Village is one of our favorite places to shoot. It weaves together such a perfect combination of pretty scenery, handsome southern homes, trees that are vibrant in almost every season, and a hint of the downtown feel. It’s like bringing so many of our favorite things together in one place! It also has a flavor of the classic southern cities of Savannah and Charleston – which were where we did Lacie and David’s destination engagement session weekend getaway. We have all the heart eyes for those memories! What made Providence Village extra special for this session was the part it played in Lacie and David’s story. Their first date was at Grille 29, so what could be a more fitting place to go? It encompasses some of the sweetest memories for them already, and this session made the memories even richer! Lacie came to us with some ideas of things she’d like to incorporate into their portrait session. We knew right then this time together would be extra fun, and we were right! Wedding champagne, confetti, and a handcrafted jewelry box designed with florals from their wedding day made for some super fun elements to incorporate. Lacie also brought in other special wedding day details. She wore her wedding day shoes and necklace. Her dress even matched their wedding day colors! They spent some time turning through the pages of their wedding album and toasted to their future happiness! 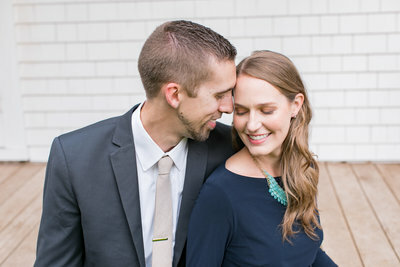 Enjoy a peek into Lacie and David’s styled anniversary Forever Session at Providence Village!